A huge number of you have been in touch to question your local MP's claims of up to £400 a month for food - which they were allowed until recently to do without submitting a receipt - and the claims for £250 a month in "petty cash" from the Incidental Expenses allowance. Many of you also ask why MPs can claim back TV licence or Sky subscription costs. We have been working through your emails, checking the receipts and contacting the MPs concerned for their response. Ben from London says Jaffa Cakes feature on nearly every claim from David Lammy. "Now I know they taste great and are a light snack but... £100 a year on Jaffa Cakes? Seems a bit too much," he says. In response the higher education minister said: "When I host constituents in Parliament it is not unusual for my office to provide light refreshments in the same way that a big company or a public sector organisation might provide clients with tea and biscuits during meetings." Meurig from Aberystwyth points out and questions a claim by the MP for Ceredigion of £100 for the cost of a locksmith to open his front door. Mr Williams says he "inadvertently" locked himself out of his flat and that calling out the locksmith was the "only means" of getting back in. One e-mail correspondent wrote in to question why Lynda Waltho, MP for Stourbridge, had submitted four identical invoices for her annual report totalling over £4,000. He also questioned why she'd apparently claimed a late payment surcharge. "It is incompetence to miss timely payment and why should the public pay for incompetence?" he asked. The MP told us the invoices were for four different delivery areas served by a local free-sheet newspaper reaching some 40,000 addresses in her constituency. "This works out at approximately 10p per household, which is good value for the taxpayer," she said. The late payment surcharge was automatically added to the bill if not settled within 14 days, she explained and they were "at the mercy" of the Fees Office who were rarely able to pay so quickly. Dave Tiltman from Caerphilly asks why his MP claimed for the cost of two Tom Tom devices in the space of three months in 2006. Mr David says he needed the sat-nav equipment to help him get around his large and rural constituency. The second device was for a member of staff who represents him at meetings around the constituency. Rich emailed from China after spotting a claim for shadow chief secretary to the Treasury Philip Hammond in which his own constituency is spelt incorrectly - with the Weybridge bit coming out as Weighbridge. A spokesman for Mr Hammond told us this was quite simply an administrative error. Alan O'Donnell from Edinburgh wonders why his MP's expenses claims contain payments to a local veterinary firm. John Barrett explains that neither he nor his family have any pets. He says his constituency office is situated next to a vets surgery and he shares the cost of a wheelie bin and associated waste removal with the business. We've had a few queries about apparent claims for glasses from Specsavers, which has particularly concerned people who weren't aware that their MP ever wore glasses or contact lenses. Having checked up on a few of these cases it seems to us that these are a series of taxi receipts which happen to advertise Specsavers on them. A reader from East Dulwich wrote in to ask why Olympics Minister Tessa Jowell had submitted a number of BT phone bills in the name of "Ms S Jowell". Could she be paying a relative's phone bill? A spokesman for the Dulwich and West Norwood MP explained that there was a simpler explanation, saying it was "due to a BT typing error". All the bills were "for (the Labour MP) and paid by her". He added that there is no Ms S Jowell in the MP's family. A reader from Wigan queried former minister Ian McCartney MP's claim of £22.18 for four blue "ear defenders". The emailer says it might be "ok if you are in the construction trade, but for an MP... and four of them". We put that comment to Mr McCartney, whose spokeswoman explained that the ear defenders were a health and safety requirement for staff in Mr McCartney's constituency office who have to use noisy lithograph machines. It was part of his duty of care to his employees. One person got in touch to point out what appeared to be a £32 claim in Spring 2007 for a coat hanger from Peter Kilfoyle. Could it really cost that much? The MP for Liverpool Walton has solved the mystery however - the claim was actually for a coat stand, for his constituency office. James got in touch to ask about Siobhain McDonagh's communications budget being spent with the Barnard Braggins Partnership, which he says is a Labour Party supporting campaign group. A spokesman for the MP confirmed that "she, as with a number of other Labour MPs, used the services of Barnard Braggins Partnership. However this was purely for communication and not political work. The political affiliation of Barnard Braggins does not have any bearing on the work that they do, just like someone may work for the BBC and have a political viewpoint yet still report neutrally". We have received an e-mail from Mr Siddiq asking why the Labour MP for Leeds North East had a claim for an Apple iPod Nano listed under his Communication Allowance, and wondering what he was using this for. In a statement, a spokesman for Mr Hamilton has told us that the iPod was for private use and was purchased at the same time as office computer equipment and should have been billed separately: "The inclusion of the item on the claim was a mistake spotted by Fabian who very quickly informed the Fees Office straight away. The mistake was spotted before any claims processing had been done. No money for the iPod was received by Mr Hamilton. The published records show the paperwork submitted but not the actual reimbursements." The Conservative MP for Reigate has had an expense claim for £88.14 for a flag pole queried by Bradley from Redhill. He wonders whether this is the best use of taxpayers' money. In a statement, Mr Blunt has said the claim is justified as "I choose to display the Union Flag in my Commons office". The Conservative MP has defended charging the taxpayer for services provided by a corporate responsibility consultancy called Sancroft, of which he is the chairman and founder. One of his constituents, Robin, of Felixstowe, questioned a payment made in 2006 for recruitment services. Mr Gummer said he claimed for 50% of the wages of his diary secretary out of his Parliamentary expenses, and his company paid the other half, even though the secretary spent more than half her time on Parliamentary work. When he came to replace the secretary his office say he and Sancroft used an independent recruitment agency, Angela Mortimer, and Mr Gummer charged half of the bill from this third party, a sum of £1,808.60, to his Parliamentary expenses. There appears to be no mention of the agency on the expenses details published on Thursday, although it could have been redacted. He said his expenses claims were among the lowest in the Commons and he had effectively obtained a "discount" for taxpayers by employing the services of his own company. "I deplore any misuse of public funds and to be criticised for doing the opposite is jolly hard," he told BBC News, adding: "The facts are that in all circumstances I have charged less than the actual cost of my work for the taxpayer." Ed in Wales has got in touch, wondering whether Welsh Secretary Peter Hain received any free tickets from Neath Rugby Club, in return for claiming £763.75 out of his communications allowance for placing an advert in the club's 2007-8 season programme. A spokesman for Mr Hain has told us categorically that the claim was approved by the Fees Office and that he received absolutely nothing in return. Several people have e-mailed to query a receipt in the Vauxhall MP's 2007/08 expenses file from John Hoey, who was paid £472.61 for web design. The Labour MP said she had turned to her brother "in desperation" after being let down by a company that was building her website. She said his bill was not as much as some firms would have charged. Peter from Cambridge queries why the Suffolk West MP should be reimbursed for the £39 he spent on buying copies of the Racing Post in April and May 2008. Mr Spring's spokeswoman points out that Newmarket, the home of the racing industry, is situated in Mr Spring's constituency and he needs the trade paper to "keep abreast" of developments affecting issues such as employment and planning. The MP only claims for the paper when the Commons is sitting, she added. Anne, from Leicester, queried a claim of £3,525 made by Leicester East MP Keith Vaz for 42,000 2008 calendars in October 2007. She was wondering if this is linked to a claim made a month later for the postage of 36,209 items at a cost of £1,756, suggesting they were early for Christmas. We've put the claim to Mr Vaz's office but they are yet to make a statement. 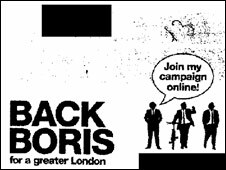 This rather surprising picture trumpeting the merits of Boris Johnson's bid to be London mayor features among what look like taxi receipts submitted by the Respect MP for Bethnal Green and Bow, George Galloway. Thanks to John from Bethnal Green for pointing it out: "I wonder if the taxi driver did it on purpose"
Conservative MP Tim Loughton was not happy with Patrick from Worthing's suggestion that he used his expenses to stock up on "boy's toys". He said that as shadow children's minister he needed a satellite navigation system to find his way round the country when he visited various children's projects and as he travelled round his Worthing and East Shoreham constituency. He needed a blue-tooth headset to operate the system legally and he had saved the taxpayer a lot of money by using digital cameras to take publicity pictures instead of hiring a professional photographer. He said he was happy to talk to any constituents about his expenses claims and he published a breakdown on his website. Robert, from Ealing, wondered if his MP, Labour's Stephen Pound, had spent £500 of taxpayers money on a season ticket for his local football club Hanwell Town. Mr Pound said the idea that anyone had ever bought a season ticket at Hanwell Town - a team he used to play for - was "risible". He said the money had been spent on advertising his constituency surgery in a match programme. He said he had claimed for a digital camera because his old one had been "smashed out of his hands" during a dispute over planning. Many constituents came to him with planning problems and he found it useful to take pictures of housing developments to stop disputes "escalating into street warfare". David from East Devon points out that East Devon MP Hugo Swire claimed for a £327.94 digital camera from Harrods. He actually bought two more in the same year - from Dixons and Jessops. Mr Swire explained that he likes to carry one in his briefcase and also have one in his office and one at home. The Tory MP's apparent enthusiasm for buying office equipment and cans of Diet Coke was questioned by Philip, of Evesham. The Mid Worcestershire MP said that as a select committee chairman he was busier than most MPs. He had purchased "two additional high volume laser jet printers (costing approximately £1,500 each) in the period to enable me to deal effectively the high volume of letters that my office generates and because, sadly, the printers provided by the Commons have proved inadequate." He said he had also bought three laptops: "One I initially used personally which I subsequently made available to my research assistant to enable him to work outside normal office hours. Another I purchased for my own use and now take away with me on all travel with my select committee and any other Parliamentary duties away from London. A third is based at my London flat to enable both me and my wife (who is my secretary) to deal with parliamentary e-mails whenever necessary." On his frequent purchases of Diet Coke, he said: "I regularly hold meetings with visitors in my office and have provided them with limited refreshments - tea, coffee, biscuits, water and Diet Coke. The sums involved - I estimate roughly around £30 a month - are modest and, I believe, appropriate when senior business people are visiting me in the Commons". Alex, from Birmingham, questioned the Labour MP's purchase of four computers between 2003 and 2006 and other equipment. We are trying to contact Mr Simon for an answer. Alan, of Gloucestershire, wanted to know why his MP Mark Harper had submitted the same receipt for £987 twice. The Conservative MP for Forest of Dean said he had not been paid that amount twice. He said he claimed £197.52 in March 2007 for a deposit on a dining table and four chairs and a coffee table for his second home and £790.08 the following month for the balance but had to submit the same receipt to receive payment. Suzanne, of Tunbridge Wells, asked why her MP, Conservative Greg Clark, seems to have claimed £57.38 for books on "hoodwinking unsuspecting strangers". In 2008, he submitted an Amazon invoice for books including "Influence: The Psychology Of Persuasion; Yes, 50 Secrets From The Science Of Persuasion; Words That Work- It's Not What You Say, It's What People Hear" and there's also "The Speechwriter's Handbook Of Humour: A Practical Guide To Getting Laughs In Public Speeches & Presentations". She adds: Even arguing that an MP might need skills like these for public speaking, surely these are self-improvements for himself & his own career and not the public's responsibility to pay? He has also claimed another £60 on books in June 2007 including one called "How Parliament Works" Should he not have worked that out before taking up office?." Mr Clark said: "These books are obviously directly relevant to being an effective MP. Most people in most jobs are expected continuously to improve the skills needed to do their work well, and I don't see why MPs should be above the need to learn." Ricky Bruce from Norwich asks why Labour MP Mr Clarke has regularly claimed for payments to Age Concern, including one for £1,225 in February 2008. Mr Clarke says the charity owns the premises in which his constituency office is based, along with that of fellow Norwich MP Ian Gibson, and he pays it rent for the space. He also pays for room hire for special meetings and weekly surgeries. A constituent questions why Labour's Mr Cawsey claimed £69 for the cost of a breathalyser and £24 for a saliva screen test kit in 2007. The MP says the items were necessary for work-related purposes. Julie from London asks why the Labour MP spent so much on postal costs in 2008 after Ms McDonagh claimed about £3,300 towards packing, posting and delivering her annual parliamentary report and calendar. Given the number of reports sent, a spokesman said he felt the postage costs were fair and it wasn't realistic to e-mail the report instead as the MP did not have all her members' email addresses. James from London has e-mailed in, having spotted receipts for books including "Austerity Britain" and a biography of Bismarck, wondering if taxpayers are subsidising MPs' personal leisure reading material. The Cities of London Conservative MP said these books were for his work with the All Party Parliamentary Group on British-German relations. Other books listed on the receipts that happened to be bought at the same time were not claimed for, he added. Michael e-mailed in to ask why taxpayers were paying for Wentworth Labour MP John Healey's shirts to be ironed. Mr Healey, who is not alone in charging laundry services to expenses, claimed £130 for four weeks of "cleaning and ironing services". Mr Healey said for the past year he had published a detailed breakdown of the office, staffing, communications, travel and additional costs allowances on his website. He said: "If I am Michael's MP he, or any constituent, can send their comments and questions to me at healeyj@parliament.uk at the same time as posting them on the BBC website, and I will give them a full, personal response directly. We as MPs are public servants. This is public money and if constituents want to know how much it costs for me to do my job as their MP, this information should be available to them." The Lib Dem MP for Kingston and Surbiton, who is also the Lib Dem foreign affairs spokesman, paid £7,345 towards the cost of a "maximailer" sorting machine. Paul, of New Malden, questioned whether this was reasonable use of funds. Mr Davey said he had paid 50% of the cost of the machine out of his own pocket, as it would be used for political purposes, rather than simply keeping in touch with his constituents and claimed the remainder on his Parliamentary communications allowance. He said the machine saved taxpayers money because it saved his staff time in stuffing envelopes and he had paid tax on it. "I don't know why more MPs don't do it," he said, adding: "If anybody thinks I have bought this machine for my own benefit they must be crackers." In 2005, Climate Change Minister Ed Miliband claimed £35.36 pictures of himself in a Parliamentary debate. His office said the material was used in newsletters to keep his constituents informed about his work in the House. Mandeep from Blackburn queried Ribble Valley Tory MP Nigel Evans' mobile phone bills - in May 2006 it was £686 on one bill - and wants to know why he could not have obtained a cheaper call plan. Mr Evans is not alone in having claimed for large mobile phone bills but he said it was a "fair criticism". He added: "I probably could have got a better plan and that is something we will have to look at". But he said he had not benefited personally from it and the high costs were due to the fact that he was on the Council of Europe and had to pay "roaming charges" when journalists called him from the UK. He said he may switch his phone off in future and get his office to text him messages. Roaming charges were also starting to come down, he added. MPs' taxi bills have also come under the spotlight. Ed, of Hemel Hempstead, wanted to know how Anne Main, Conservative MP for St Albans, could justify a £68 taxi fare. Ms Main was not available for comment but her office said she was happy to address personally any concerns constituents had. The Labour MP for Stockport claimed twice in the same year for digital cameras - £199.95 for a Sony Cybershot in October 2007 and £169.99 for a Panasonic digital camera and associated equipment about three months later. Ms Coffey said she lost the first camera and she needed to take pictures for her constituency newsletter. Justin, from Reading, wanted to know why his MP, Labour's Martin Salter, appeared to have claimed for a £4.99 Toblerone bar. Mr Salter said the item had been a free gift from a supplier and he had not claimed taxpayers' money for it. In 2005, the Conservative shadow chancellor claimed £47 for two copies of a DVD of his own speech on 'Value for Taxpayers Money'. A spokesman for Mr Osborne said: "Four years ago George received a request from a member of the public for a video copy of the speech which he obtained through the House of Commons broadcasting unit." Kevin, from Altrincham, spotted a £10 claim by Conservative MP for Altrincham and Sale West for a "milk frother" in 2007/08 and, on the same receipt, £21 for a black toilet roll holder. Mr Brady has yet to respond. The Conservative MP for Basingstoke was paid £154.61 for books in February 2008. The invoices she submitted from Amazon list political titles, including books on Tony Blair such as Blair Unbound, Blair's Britain. One receipt also shows children's books, including Vikings Don't Wear Pants: Potty Poems of the Past, but Ms Miller has categorically denied claiming for these, saying she was only reimbursed for books connected with her political work. In 2007, the Labour MP for Delyn claimed £100 from his communications allowance to sponsor a match at a local football club Flint Town United. Mr Hanson said: "I was given the opportunity to promote my surgeries, which help hundreds of my constituents every year, and give out my contact details through a sponsorship package for Flint's local football team. The claim was cleared and put through via the communication allowance." In November 2007, the Labour MP for Falkirk seems to have claimed £39.99 for a remembrance wreath. The claim is for Lady Hague Poppy Factory but there is a line through it, suggesting he may have since repaid the amount. In October 2007 there is a receipt for an Oil Painting on Canvas for £160. All details are redacted except the name of the company Art and More. In May 2007 Mr Joyce claimed £235 for an Assertiveness at Work training course. Mr Joyce said a member of his staff attended the course, not him. He confirmed he had three oil paintings in his Falkirk office. And he says the claim for a remembrance wreath was an office mistake. The Tory MP, who is standing down at the next election following revelations about his second home allowances in the Telegraph consistently claimed £250 per month (£3,000 over the year) for "petty cash". He also claimed over £200 for his annual subscriptions to the Spectator and the Economist. The prime minister claimed £176.25 on his Communications Allowance in January 2008 for a CD of photographs of himself. Downing Street said the photos of Mr Brown were used for publicity material in his constituency. Various people have pointed out that Conservative leader David Cameron claimed £564 to "rework photos on his website". A spokeswoman for Mr Cameron said the work was to help people with reduced vision to see the website. He no longer claims for the site, she added, and its cost is met entirely by the Conservative Party. The former prime minister claimed for roof repairs to his second home on the 8 June 2007 - just before he stopped being PM and an MP. The repairs cost £6,990. A spokesman for Mr Blair said: "Roof repairs were carried out well before Tony Blair announced that he was standing down as PM, but the claim was made much later." It is understood the work was carried out in January 2007. We know, thanks to the Daily Telegraph revelations, that Margaret Moran claimed £22,000 for dry rot on her second home. The receipts released with details blacked out do not show her second home was in Southampton -100 miles from her Luton constituency. There is also no mention of Sir Peter Viggers' attempts to claim £1,645 for a "duck island".